Like our approach to Play Planning, our Play Review was something that grew and developed over time. At the beginning of September, our oral review after play time was general and undirected. 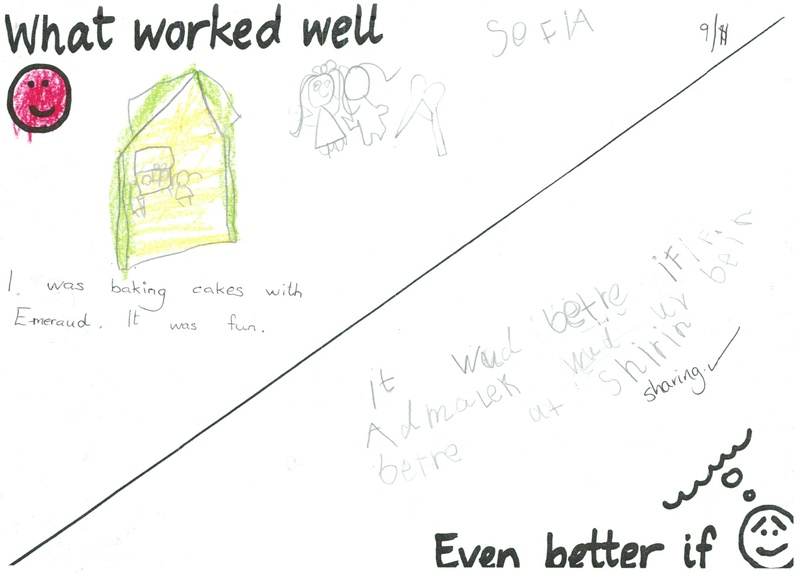 The children were inclined to comment positively about every play experience, saying that they had had fun, regardless of any organisational or interpersonal problems they may have had. They were also unlikely to recognise any discrepancies between the play they had planned and what they actually ended up doing. 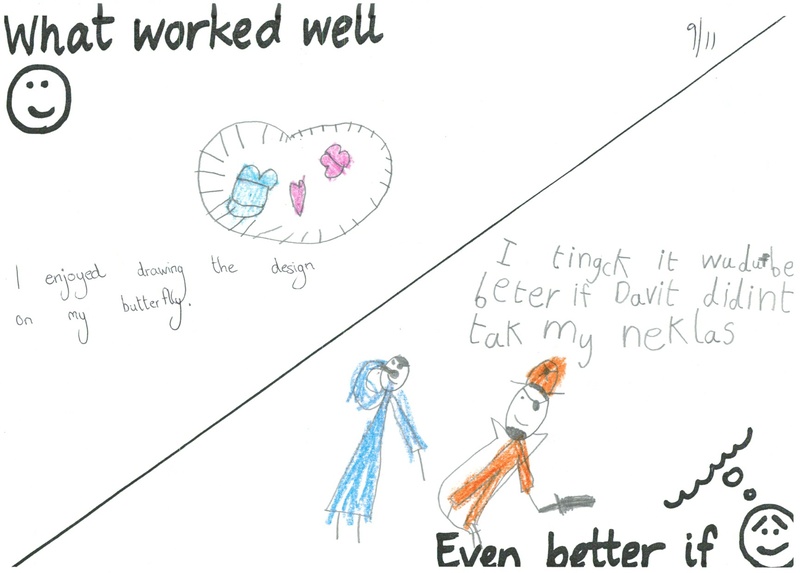 Our first pointed attempts at Reviewing our play were gentle and designed in such a way that all of the children could easily participate. 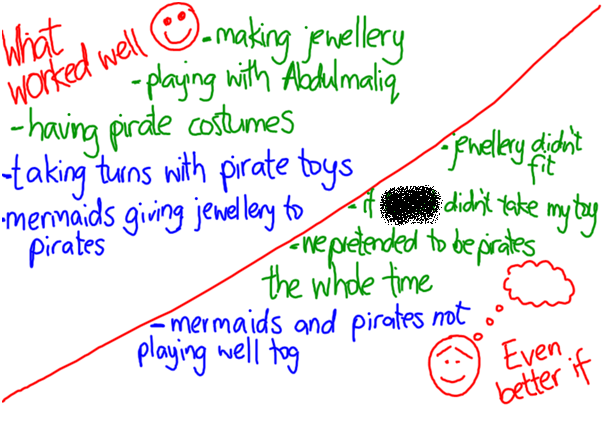 Having planned our play as a whole class and noted our plans on the board, we returned to the board after play time, to ‘check in’ and see how our actual play compared to our initial plans. 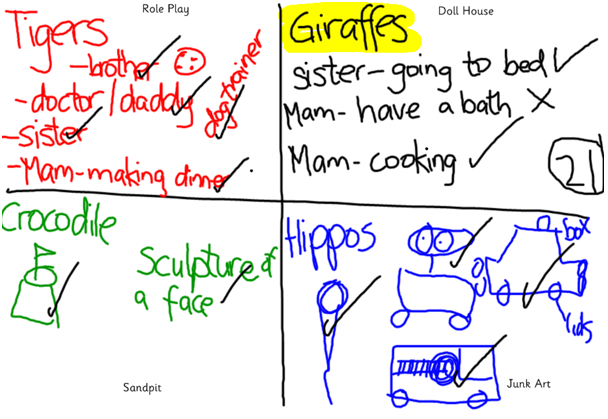 A simple tick beside each achieved plan allowed us to see how many people’s plans usefully informed their play, and gave us the opportunity to analyse why some people’s plans were insufficient to inform their hour of play. 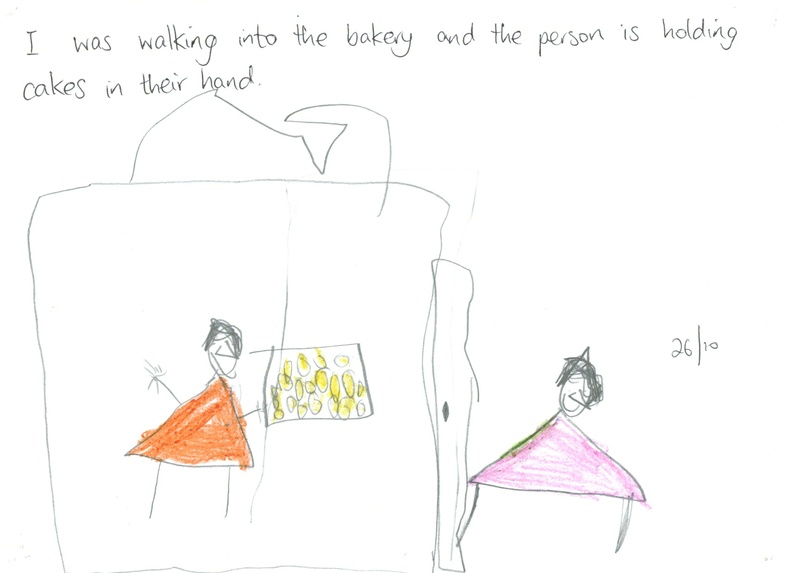 It was around this time that the children were given an opportunity to draw a picture of their play, again in an attempt to have them reflect on what they had played and with who. 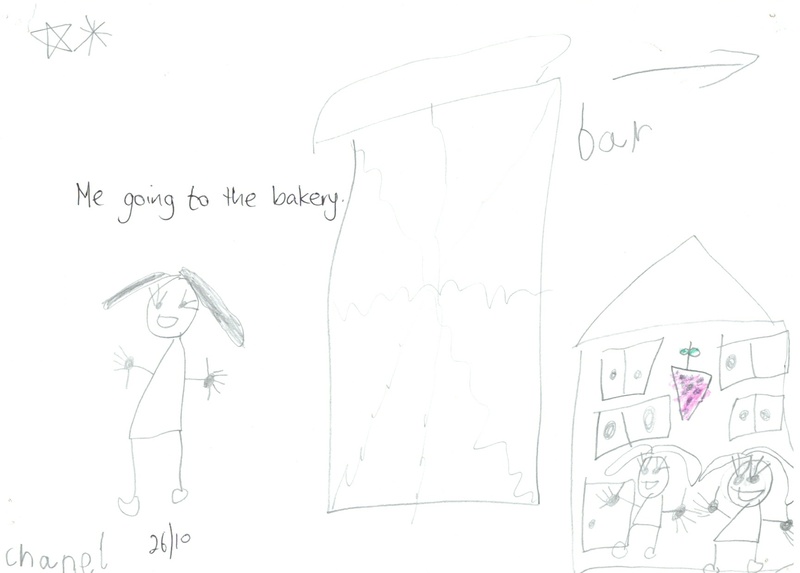 They were encouraged to comment on any challenges or difficulties that they faced in their play, but the children seemed to draw a blank when asked about this. 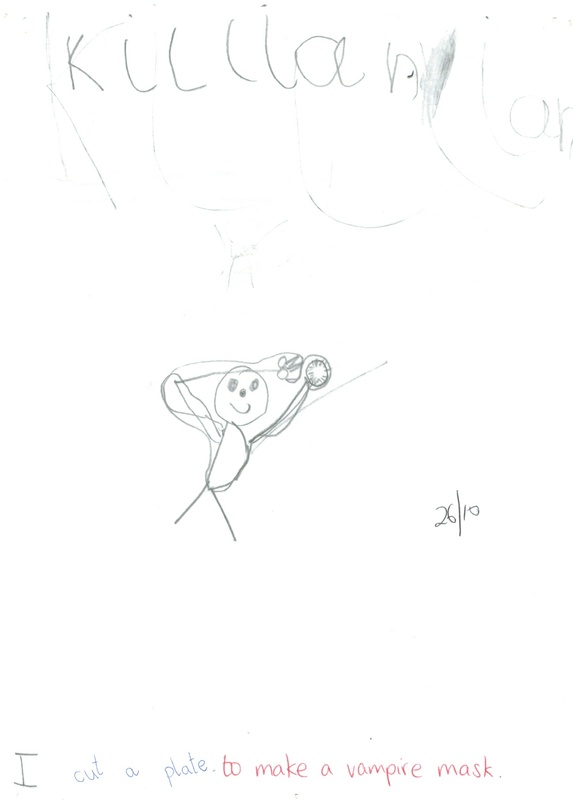 Please click on images of children’s work to see more detail. Tymek and Emeraude playing Snap Apple. 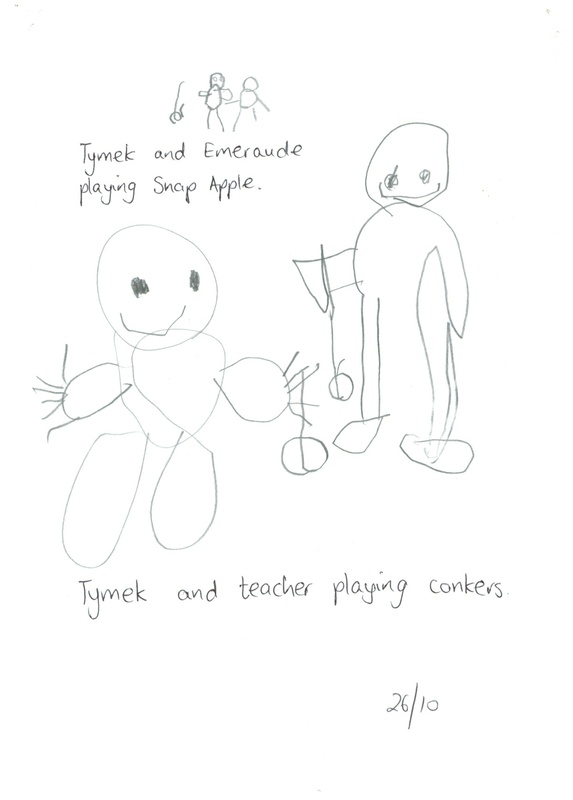 Tymek and teacher playing Conkers. During the week in which our planning focused specifically on the Role Play, we used Review time to focus on the Role Play area as well. Perhaps the freedom to discuss only one of the play areas at length was what gave us the time to reflect specifically on the positives and negatives of a particular play experience. 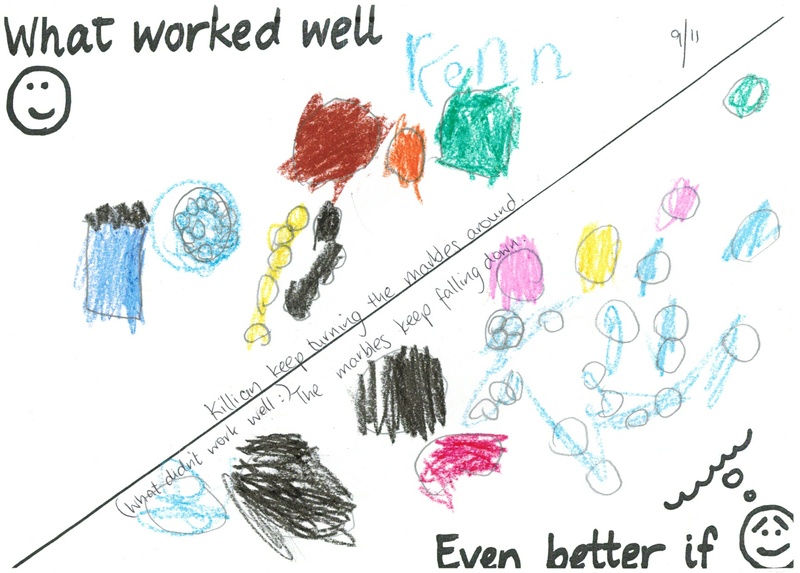 The children still contributed what was ‘fun’ for ‘What Worked Well’, but began to see the value of commenting on aspects of play that frustrated them. 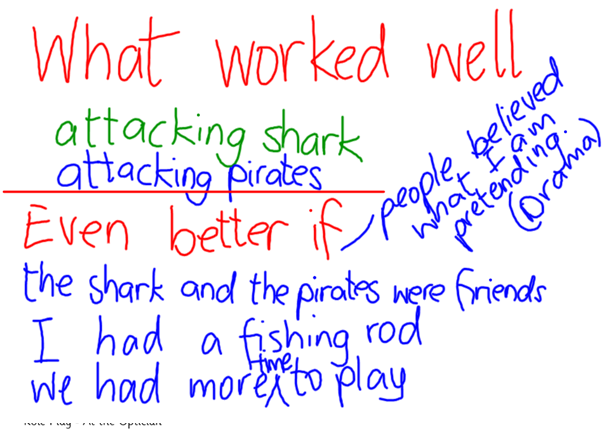 Over the course of that week we developed a ‘What Worked Well/ Even Better If’ template for review, which the children now immediately recognise and respond to. 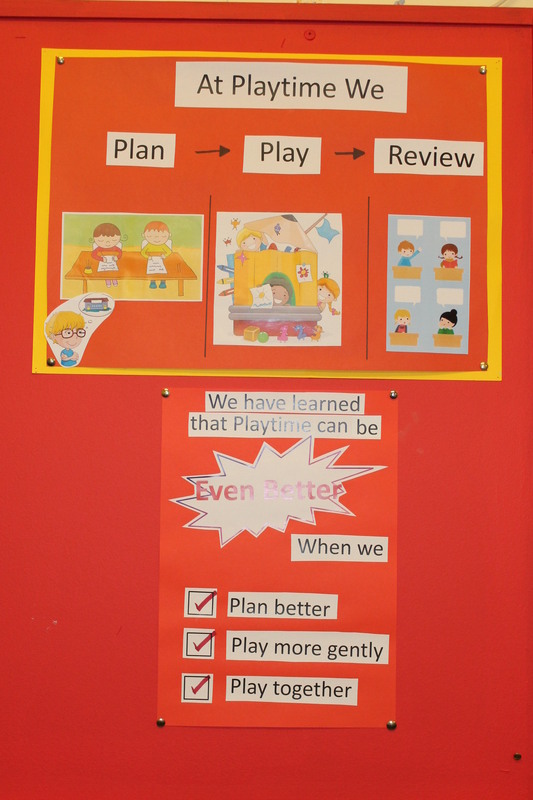 The following week, our Review template was broadened to apply to all play and we began to use it on a daily basis as a structure by which to reflect on our play. It wasn’t long before we began to notice common problems with our play. Issues relating to cooperative play are highlighted in green and planning issues are listed in red. 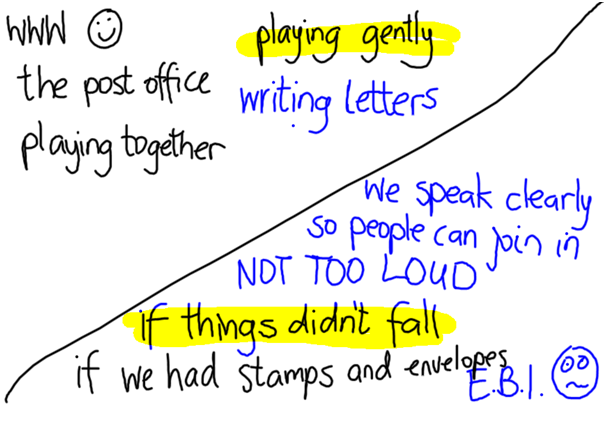 We regularly had issues with children knocking each other’s creations (when playing with blocks, or doll house, or even in the Role Play area) or accidentally hurting one another, and began to categorise these problems under the title ‘Playing Gently’. 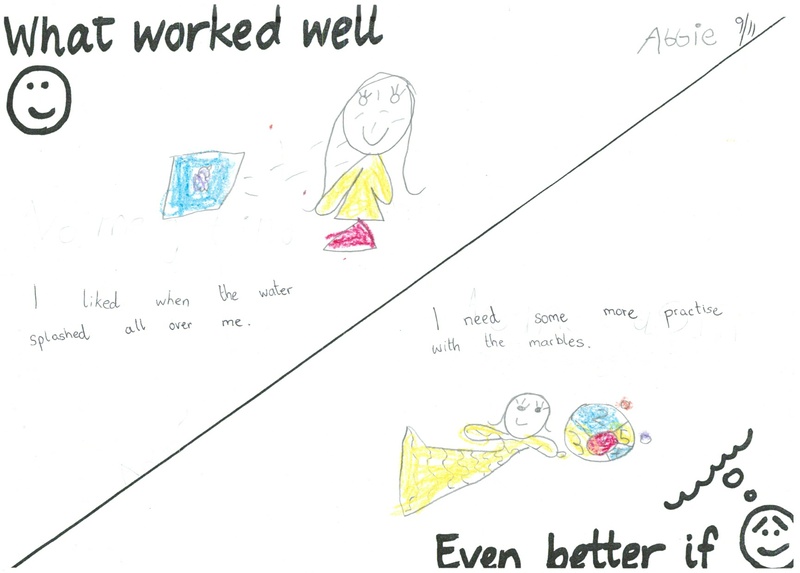 Children also began to comment positively if their creations weren’t knocked, so that Playing Gently could be highlighted as a positive result of our efforts to play more considerately. Other common issues we identified were those of inadequate planning, leading to insufficient time to complete the planned play (which we try to list in a red font) and failing to play cooperatively, which can cause conflict in relation to sharing of toys/ resources, and can limit the enjoyability of play in more interpersonal areas like Role Play and Doll House/ Small World (these issues are highlighted in green). Developing the habit of referring to the WWW/EBI template at the end of play allowed the children to develop the skill of casting a critical eye on their play. This has led to us now being capable of critically reflecting on Play time, without the framework. 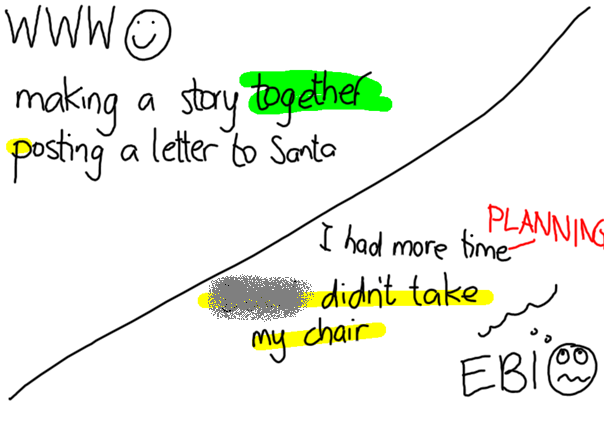 This progression has been satisfying and fulfilling for me as a teacher.